Prayer Meetings 5.45 and 6.15pm. Anyone wishing to have a child baptised speak to Rev Bingham. The next baptisms will take place on Sunday 24th June at 11.30am. Commissioning Service for Summer Teams .Anyone involved in any outreach team or youth week leader should sign their name on the sheet in the vestibule by Sunday 10th June please. In the Youth centre before church on Sunday mornings. Senior Youth Fellowship in The Youth Centre. Saturday 9th June departing from the Church at 9.00am. 5.00pm – Evening Meal at Rockmount Golf Club. Each Wednesday from 9.30am – 11.30am in the Church Hall. For babies and young children up to 4 years old. All parents welcome. In the Church on Wednesday evenings at 8.00pm. The joint prayer meeting will be held on Friday 29th June at 7.00am in Mourne Presbyterian Church Hall. The Committee will meet on Tuesday 19th June at 8.00pm in the Church Office. The Kirk Session will meet for a few moments after the Committee meeting. Programmes containing details of the June walks are available in the porches. Walks in June take place every Monday evening and Saturday 2nd and 30th. Walks suitable for everyone. Donations towards the Livingstonia Project gratefully received. Everyone welcome. Saturday 23rd June from 10.00am to 12.00 noon in support of Amy Stevenson’s and Philip Annett’s mission trip to Uganda. Donations of cakes would be very much appreciated. Sunday 3rd June at 8.30pm. Monday 25th June at 8.00pm in The Upper Room. “Faith and Football 2018 – Monday 25th to Thursday 28th of June, 7-8:30pm at the New Ground, Bulgers Lane. 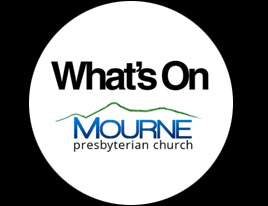 We would love your child or young person to come along, please complete the online registration at www.mournepc.org by Monday the 18th June. If you would like to help in the running of Faith and Football this year we’d be delighted to have you as part of the team. We don’t just need football coaches! We need volunteers for setting up, registration, supervising children, toilet runs, final night bbq, organising prizes and much more. If you would like to help at three or four nights of Faith and Football we need you to do two things. First, you need to be AccessNI checked. If you have not already been checked through PCI, pick up an Application Form and Guidance Notes from the front vestibule in the church. Second, please come to the team training on Wednesday 6th of June from 7:30-9:00pm. If someone is admitted to hospital please contact the Rev Bingham as lists of patients are not available due to data protection regulations. Following consultations with the Health and Safety Executive Northern Ireland, potential safety hazards were highlighted with the traffic control in the area of the church. Concerns have also been raised to the church committee regarding the wellbeing of pedestrians in the church grounds, primarily children, especially during Sunday School times and at the drop off and collection times of the uniformed organisations. As a result of this the church committee has had additional traffic markings painted around the church. • we would also people to use the new church car park, accessed via the side of the First Trust Bank and which is open during the morning and evening services. Family Fun Day and BBQ 3.30-7pm . Games, bouncy castles and face painting. Free for all. Everyone welcome. New Ground at the back of the church.